Chris Lightfoot was a gifted and committed software developer, who died in February aged 28. You get a good sense of his talents and achievements from this obituary by MySociety's Tom Steinberg and from this one in The Times. Chris was the developer behind the previously featured Pledgebank and WriteToThem (which provides a reliable way to write to your elected representatives), and other systems, for example the Downing Street on-line petition web site, Political Survey, as well as the system that generates maps like the one above, which shows travel-time "isochrones" around Edinburgh. 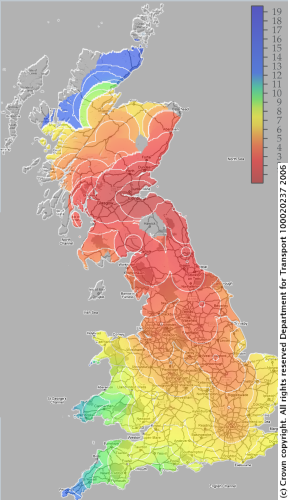 For an explanatory essay, and some other travel-time isochrone maps, see this page on the MySociety web site. Links fixed 15 August 2012. On 22/3/2007 I took part (in my ALT role) in a "round table" organised in Birmingham by Desire2Learn entitled "personalisation and innovation in education". Participants came from across the spectrum of English public sector education, including primary schools, secondary schools, technology colleges, city academies, universities. There was no hard sell from Desire2Learn: indeed, no sell of any kind. By far the most impressive part of the session was the time given over to reports from Balsall Common Primary School in Coventry, Longfield School in Darlington, King John School in Essex (web site built using Drupal), Walsall Academy in West Bromwich, Djanogly City Academy in Nottingham, about what they are doing to use learning technology to support the curriculum. Correction: about what they are doing to change the curriculum to make it learner-centred, and the role (sometimes only a small role) in this of learning technology. Three things came across to me from the discussion. Firstly, that a far better term to use than "personalised" is "learner-centred": the learning is effective because learners, whatever their age, are committed, challenged, and given control (for more on this see Itiel Dror's 3 C's of Learning). Secondly, that whilst the National Curriculum exists as it is, and whilst schools are constrained by Government testing and reporting requirements, the push for personalisation (a.k.a. learner-centred provision) will come to very little. Finally, that learning technologists (for that is what all of us at the round table are), have a great deal in common, irrespective of whether we work in industry, adult learning, schools, colleges, or universities. Getting transfer of good practice between us is a worthwhile endeavour. Using a third party remotely hosted system for setting up meetings has risks, partly because of the data that is involved (you need to trust the service provider), and partly because if the services fails mid way through fixing a date you get egg on your face. But such services are a big, time-saving improvement on email. I make a lot of use and highly rate Meetomatic. Via Wayne Hodgins I came across a service with similar features called Doodle, by Michael Näf. It has a less "retro" design than Meetomatic, and allows you to specific discrete time slots for potential meetings; and unlike Meetomatic, Doodle publishes all users' availability as this information becomes available, so using it feels like more of a collective process than with Meetomatic, where only the organiser of the meeting sees participants' availability. Doodle is also available in French, German, and Rumanian, as well as English, and, unlike Meetomatic, it carries no advertising. For the moment I will stick with Meetomatic, but Doodle is the first alternative that comes close. In February, Mike Collett wrote a Guest Contribution about The Global 2007 conference, which took place in London on 19 March. Kevin Donovan was there, and has written a report from the event for the Association for Learning Technology (ALT) - for which I work part time. An edited version of Kevin's report, with photos, will appear in the next issue of the ALT Newsletter. In the meantime, an unedited version, in plain text, is on the ALT web site. Here is the article's introductory summary. The Global 2007 conference was held in London on 19th March. Sponsored by the DfES and ADL (Advanced Distributed Learning – the organisation responsible for SCORM), and with support from all the key interoperability standards organisations, the event was held to discuss good practice relating to the use of technology in "learning, education and training". But more importantly it was the start of the process by which the stewardship of SCORM is transferred from the US Department of Defence (which manages ADL) to a new body. Earlier this month I wrote a post picking up on John Mayer's work on the (beneficial) impact of podcasting in US legal education. Here is a link to the relevant FAQ page on the CALI web site, which covers a lot of the practicalities. Some of it is very specific to the CALI set-up. Some of it much less so. I came across this 11 October 2006 speech by Mark Thompson, BBC Director General. The speech ranges widely. This section on Jam, the BBC's online learning service, which the BBC will suspend tomorrow, with its challenging assertion by Stephen Heppell about the "lack of agility of the UK software industry", indicates just how much the BBC had staked on Jam. "The third priority was education. I've already mentioned the massive investment we've made in specialist factual output – programmes like Planet Earth and Ancient Rome on TV alongside extensive commitments on both radio and the web. But the centrepiece is undoubtedly the Digital Curriculum, or BBC Jam as it is now called. After a difficult and contentious birth, I believe this is shaping up to be one of the most important services the BBC has ever launched. Over the past seven years, the BBC's exam revision service Bitesize has grown to the point where it is used by nearly three-quarters of all students taking GCSEs. In time Jam may enjoy a similar reach. Not just because of its imagination and flair, but because it has been designed wholly around children and can be used just as easily by students and parents at home as in the classroom. Jam has already had other benefits too. Professor Stephen Heppell from Bournemouth University is a world class expert in online learning who has been working as an independent advisor to the BBC. This is what he has to say of the creative and technical process that has led to the launch of the service: 'what Jam now offers is a uniquely agile, really quite organic, large scale development model that is without equal anywhere in the world. My belief is that we will need to document and share this agility – apart from the Jam partners, the UK software industry lacks it and can learn so much from it. This is an unexpected contribution.'" 19 March 2007 - BBC Director General Mark Thompson on Jam, in October 2006. 17 March 2007 - BBC Jam. We need usage data. 14 March 2007 - BBC suspends Jam, its flagship online learning web site. In 2006 Keith Burnett did a well read Guest Contribution about using Blogger to get teachers started with e-learning. His Bodmas blog has a striking new look and feel. I like the way all four columns have their widths set relatively, so that you can see them all however wide you browser is set. "It is strange and striking that climate change activists have not committed any acts of terrorism. After all, terrorism is for the individual by far the modern world's most effective form of political action, and climate change is an issue about which people feel just as strongly as about, say, animal rights. This is especially noticeable when you bear in mind the ease of things like blowing up petrol stations, or vandalising SUVs. In cities, SUVs are loathed by everyone except the people who drive them; and in a city the size of London, a few dozen people could in a short space of time make the ownership of these cars effectively impossible, just by running keys down the side of them, at a cost to the owner of several thousand pounds a time. Say fifty people vandalising four cars each every night for a month: six thousand trashed SUVs in a month and the Chelsea tractors would soon be disappearing from our streets. So why don't these things happen? Is it because the people who feel strongly about climate change are simply too nice, too educated, to do anything of the sort? (But terrorists are often highly educated.) Or is it that even the people who feel most strongly about climate change on some level can’t quite bring themselves to believe in it?" BBC Jam. We need usage data. I've updated a piece I wrote on 14/3/2007 about the BBC's decision to suspend/scrap its £150m online learning service for school pupils. I started off pretty sceptical about the value of the service, and so far I'm not convinced by the assertions being made that more recently released content was of a much higher standard than the earliest Jam material, and that some amazingly good content was about to be released by Jam, which would win over the doubters. Of particular interest is the actual use to which the content that has been released to date (a subset of what has been produced) has been put. To access the main features of Jam see Jam at all you needed to register, so not much can be read into the fact that 170,000 user accounts on Jam had been created. the pattern and volume of use made of different parts of the materials by different classes of account-holder. And, separately from this kind of data, which you would hope could be provided quickly and easily by the BBC from its logs (and is probably already known by people inside the Jam machine - who could post a comment here, or send me data privately), we need a feel for the extent to which teachers have been building use of Jam into course provision, if indeed that has been happening. If learners in large numbers are dependent on a service that is being suddenly switched off, that would put the BBC Trust's decision in different light from if they are not. But how different? The average spend, for a service that has been available for over a year, has been around £500 per registered user. I'd be surprised if even 25% of the registered users are "real users", rather than users who were just taking a look. Thus an average spend to date on Jam of £2000 per real user, and possibly a great deal more, may be a more realistic figure: on a par with, say, what the state spends to teach a school pupil for one year. Of course the intention was that the content would be in use for more than a year, and that the number of real users would grow, so the average annual spend per user would have fallen. But on the face of it I think that when and if the usage date is made available it will serve to undermine the case for Jam, rather than to support it. Sloan-C Wiki - examples of student-generated content, including one from the University of Reading. The dependable Sloan Consortium has just published a new area of its Effective Practives wiki that showcases specific examples of how student-generated content can be used effectively in online education. So far there are seven examples, including one each from Japan and from the UK. There is also a link to a short essay about student-generated content.